Clashes have broken out in East Jerusalem amid high tensions after Palestinian groups called for a day of protest over access to al-Aqsa mosque. 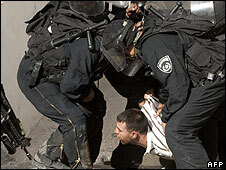 Eleven police officers were injured and at least two Palestinians arrested as youths threw stones. But Friday prayers at the flashpoint holy site passed off largely peacefully amid a heavy Israeli police presence. Meanwhile, Israeli PM Benjamin Netanyahu said talks with US envoy George Mitchell were "constructive". Mr Mitchell was due to meet with Palestinian leader Mahmoud Abbas on Friday, and to hold further talks with Mr Netanyahu's aides on Saturday. US attempts to restart peace negotiations appear to have stalled over Israel's refusal to meet US and Palestinian demands that it freeze all settlement activity in the West Bank. Israel has made clear that it intends to keep building in East Jerusalem, where the Palestinians want the capital of their future state. The Palestinian Authority has accused Israel of seeking to "Judaise" East Jerusalem, and of allowing extremists access to the al-Aqsa mosque compound while denying it to Muslims. Thousands of extra Israeli police were deployed on Friday after sporadic clashes over the past two weeks, apparently sparked by Palestinian fears that Jewish extremists were seeking to enter the third holiest site in Islam. The complex, known to Muslims as Haram al-Sharif and Jews as Temple Mount, houses both al-Aqsa mosque and the Jewish holy site, the Western Wall. The Islamist group Hamas had called for a "day of rage" on Friday, local media said, while its rival Fatah had urged a strike and peaceful protests in support of the mosque. The Islamic Movement - a political organisation based in Israel - had urged Muslim citizens of Israel to flock to Jerusalem to "defend al-Aqsa". On Friday Israeli police maintained restrictions under which only female worshippers and men over the age of 50 were permitted to enter the mosque area. The site and surrounding area in the Old City remained calm, with many shops closed. 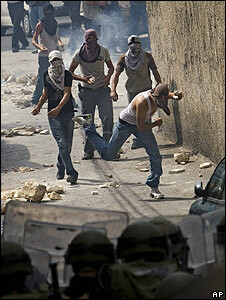 But in the Ras al-Amoud area of East Jerusalem, masked Palestinian youths began hurling stones at police in riot gear. Clashes were reported at Qalandia checkpoint near the West Bank city of Ramallah. And the Islamic movement Hamas held a rally in the Gaza Strip, which it controls. Tensions have been high since 30 people were injured in a riot at the al-Aqsa complex in late September. Palestinians threw stones at visitors they believed were right-wing Jews, although Israeli police say they were French tourists. The site has been a flashpoint for violence in the past, including the beginning of the intifada or uprising that started in 2000.